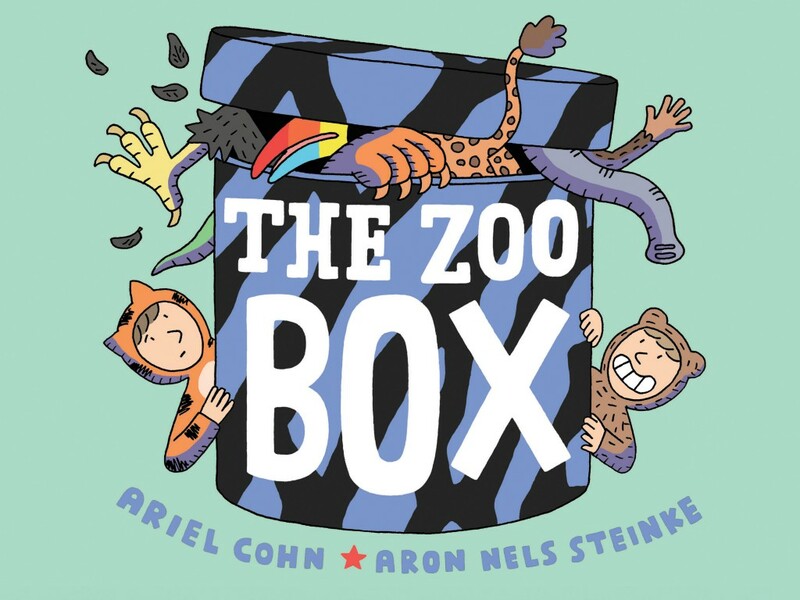 Vegbooks readers will rejoice that The Zoo Box by Ariel Cohn and Aron Nels Steinke gets kids thinking about what it would mean to be on the other side of a zoo exhibit without being preachy or making conclusions on their behalf. Spoiler alert: I’ll detail the storyline here since the spoilers are useful to anyone searching for a book such as this but if you don’t want to have the story spoiled, it is certainly appropriate for veg families and has a wonderful artistic style along with a graphic novel style layout/narrative. Nothing is overly explained but the illustrations have subtle surprises that make re-reading a lot of fun. My 3- and 5-year-old enjoyed it a lot! Erika and Patrick’s parents are leaving for the evening and they are told that if they’ve gone to bed before their parents return they can go to the zoo the next day. The first thing the kids do is go up to the attic and play dress up. Erika is a tiger and Patrick is a bear as they play and chase and hit each other with pillows upstairs until they discover a zebra-print box labeled merely “do not open.” The pair open the hatbox and an ostrich leaps out. Despite this warning that the box is not what it seems, they peek in again only to be inundated with animals (a penguin, snake, and kangaroo to name a few). They hide in the closet but can’t resist checking out the animals in their house so when the animals appear to be leaving, the siblings follow the animals through the woods to what appears to be a zoo. The final panel is my favorite – both kids are awake and in their beds while the red balloon floats overhead. For my son, he loved the anthropomorphic zoo guests while my daughter and I talked about whether we thought the kids had really had their adventure or not. Subtly, though, is the idea that we wouldn’t like being in an exhibit. I know families are divided on the subject of zoos – we’ve taken our children to zoos that have research and conservation elements and feel comfortable with that choice but I know there are those that are staunchly against zoos of any kind. This book could go either way depending on the experiences you’ve had and in that sense it is very versatile. The publisher sent a copy of this book for review. It is being released in September 2014.